At Orientation we will introduce you to York resources, New College resources (York's Community for BCOM, BHRM, ITEC and BDEM), your professional school, your program of study, academic services, social activities, recreational and sports activities available to you. We want to help you transition to university and make connections so you will feel at home. Winter Orientation took place on Friday January 4, 2019. As a new student starting university, there are a lot of questions to ask about classes and student life. This is why New College is a part of York Orientation Day and welcomes all incoming students (domestic, international, exchange, transfer and mature). 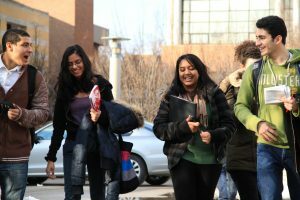 New College introduces students to their program of studies, various academic services, financial resources, social activities along with important tools that will give a smooth transition to university life. Our job is to help build these connections, and ensure students like you feel at home. So who should register for York Orientation Day (New College)? Business Systems Analysis, E-Commerce Development or Information Technology Auditing & Assurance. Please be aware that York Orientation Day is an essential program for all new students, and attendance is strongly recommended.